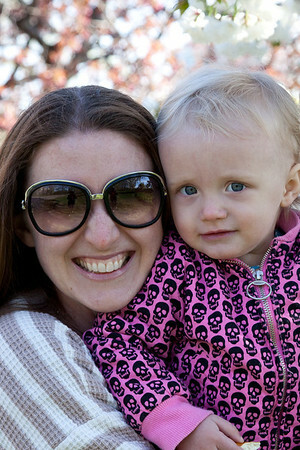 A kiss good night | Musings on life and motherhood from an Aussie living in NYC. 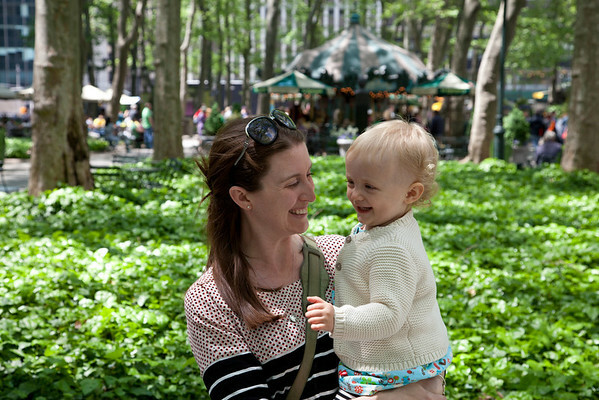 Musings on life and motherhood from an Aussie living in NYC. 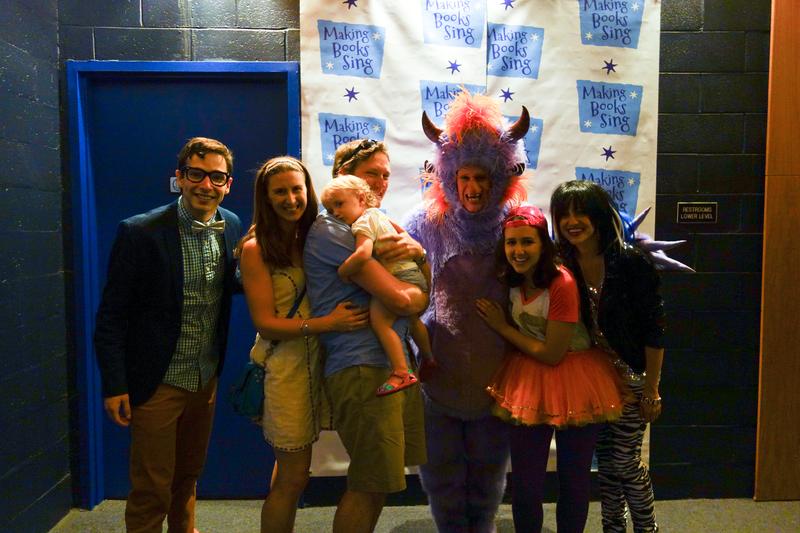 Today was a landmark day for us – we took Cheese to her first musical, at age 22 months. 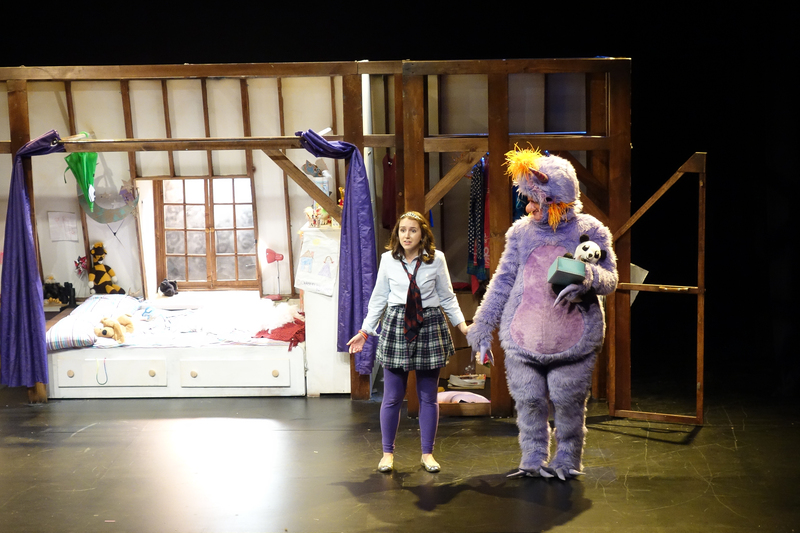 The show was Wanda’s Monster, a really cute off-Broadway show, perfect for kids aged two to 10. 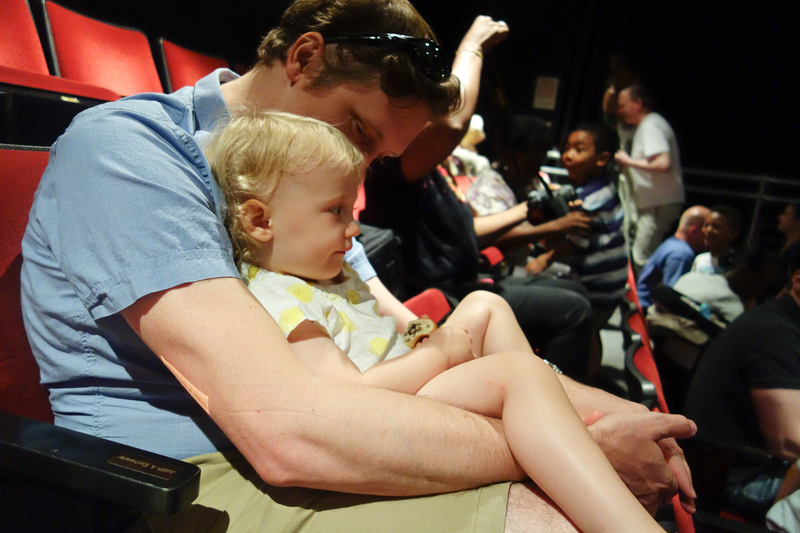 We weren’t sure if it was a good idea to take Cheese seeing as she’s such a wiggle monster that we can’t even take her to a 30 minute music class anymore, but I really wanted to see how she enjoyed watching a real show. Wanda’s Monster, in its essence, is about a girl called Wanda who discovers a monster living in her closet. At first she is scared of the monster, then, after receiving some advice from her super-hip grandmother, pushes through her fear to get to know him, gaining a new friend in the process. 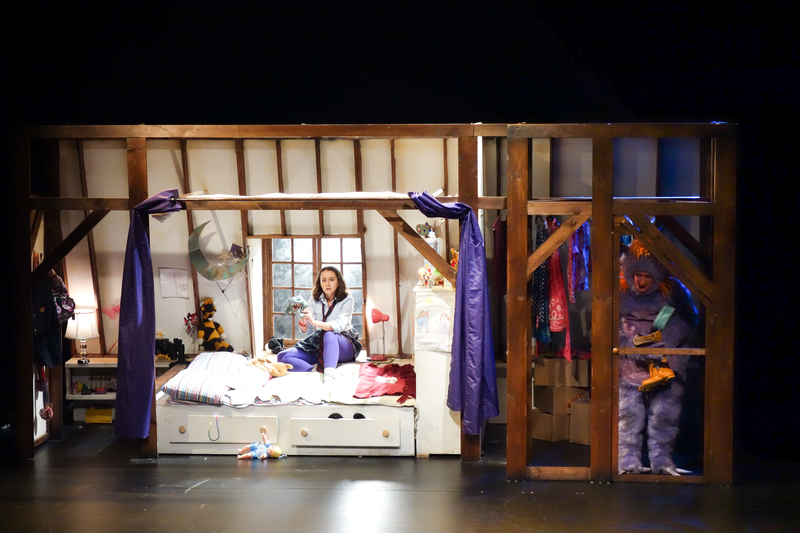 While the story is very simple (hey, it’s a kids’ musical after all! ), the underlying messages of tolerance and acceptance are important lessons for us to learn (and be reminded of) at any age. We sat in the back row in anticipation of needing to bolt after 10 minutes or less, and were stunned that we made it through the entire show, without a single wiggle. Cheese loved Wanda and the monster – asking for Wanda every time she left the stage, and pointing to the monster and saying with conviction “Mon! Mon!” (she hasn’t quite mastered multi-syllable words yet). After the show we met the cast. Cheese was too shy to pat the monster or high-five Wanda. As we left she stopped to wave to the cast, yelling “Bye bye Mon!”. A new musical (and monster) fan is born. 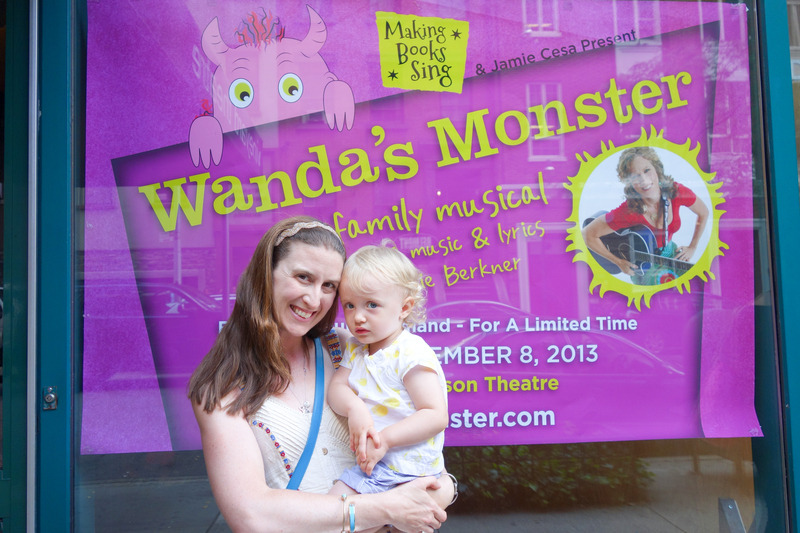 Wanda’s Monster is playing July 13 – September 8, 2013, at Vineyard’s Dimson Theatre, Union Square. At 50 minutes (no interval) it’s the perfect length to try for your kid’s first show, or to take older kids who enjoy monsters. A few of the older toddlers were scared of the monster (Cheese knowingly said “Baby” when one such toddler wailed and needed to be removed from the theater), but by the end all the kids were dancing in their seats and shouting out “Rooaaarrrrrrr!”. Buy tickets here. Use the code MBSAVE to score a 25% discount on full-pried tickets. I was not compensated for this blog post. While I was invited to attend a special bloggers’ preview of the show, all opinions are my own. The show rocked. Take your kids, you’ll all have a blast. This article was originally posted on the Kidz Central Station blog. As mother to a rambunctious toddler, there are certain things I steer clear of: stores with fragile items on display, activities requiring the toddler to sit still, and open access to chocolate. So it was definitely an out of the ordinary day that saw us attending a book reading and signing of brunchwithmybaby.com co-founder Alexis Barad-Cutler, for her new book, Who Are We? An Animal Guessing Game. The reading and signing was hosted by Annie’s Blue Ribbon General Store in Brooklyn, one of our fave stores in the ‘hood for gifts for family and friends of all ages. All three danger zones were in full force – china cows, glass vases and oversized coffee mugs at toddler level, a reading (requiring, you guessed it, sitting and listening, two skills that my toddler pretends not to have), and a huge open carton of Trader Joe Chocolate Cats, helpfully handed out by another toddler hopped up on sugar. You’ve probably attended a book reading or signing, at least once. For adults, they’re usually a pretty calm affair. The attendees sit in chairs, quietly, while the author reads a chapter, and then sits behind a desk and signs copies for attendees in a neat line. A book reading and signing for kids is more like a baby mosh pit than the serene scene described above. Picture 10 toddlers between the ages of 18 months and two years old, in a store filled with pretty, shiny things, and easy access to food. Yes, chaos, and yes, they egg each other on. When it was time for Alexis to perform the reading, kids and adults all sat on the floor. Well, the adults sat, while the toddlers stood, performed yoga, stuffed their faces with the chocolate cat cookies, and, in my toddler’s case, assisted the author with her reading by helping her turn the pages and open the flaps. Each spread inside the book features gatefold flaps that unfold to reveal the animal that’s being asked about. (The kids seemed to enjoy the element of surprise of seeing what’s underneath each flap.) My daughter’s favorite spread was the one with the snakes because she likes to make the snake sound (ssssss!). The adults liked the simple, rhyming text and the illustrations. The book was well received by all adults and most of the toddlers (hey, they’re pretty discerning mini-people). It was a crazy experience, and thankfully nothing was broken, no kids were lost, and everyone slept well after coming down from their massive sugar crash. Thinking of taking your toddler to a book reading and signing and scared of how they’ll behave? Just do it – it will be a fun and totally hilarious experience that you’ll be laughing over for weeks to come. Just remember to bring your camera, and cash incase they trash more than just your reputation. When my baby was tiny, I used to pop her in a sling and take her everywhere. She’d sleep through lunch at Balthazar, exhibitions at the MoMA, and if she woke up, she’d quietly look at the Whitney Biennial with her big blue eyes, taking in performance art at its finest. I thought I was raising a cultured New Yorker, and expected that as she grew into a toddler that our excursions would be even more fun. I imagined her learning colours from Monet and Van Gogh at the Met, and developing a broad palate from devouring dim sum at the Nom Wah Tea Parlor. Perhaps this lies FAR in our future, because today’s truth is that taking my 21-month-old toddler out of the house is an extreme sport. There’s pushing, pulling, lifting and shoving involved. There’s running, jumping, grabbing, cajoling and (yes, I admit it) yelling. This makes for an exhausting outing pretty much every time we walk out the door. Looking on the bright side though, here are five extreme sports I will never have to try myself – because I’m living vicariously through my little girl. Everytime we enter a playground, my toddler dashes for the play equipment. The big kid play equipment. She hauls her tiny body up the stairs, and then bolts, squealing with joy, for the first cliff edge. Where she then proceeds to hurl herself off the precipice, as I run, heart in my mouth, to catch her. Just like parkour-lovers, my toddler thinks every single gutter, step, stoop and ladder rung is made for climbing on, over and through. Walking down the street has become a teetering bolt between each apparatus, her little head wobbling just a split second behind the rest of her body, and her mad circuit interrupted intermittently by faceplants, grazed knees, and even the odd busted lip. Toys that require toddlers to be pushed by adults bending over are instruments of torture. Of course we bought our toddler one of these before we realised what a trap it was. Now she lights up with glee when she discovers its latest hiding spot, and squawks with demanding insistence until one of us suckers pushes her around and around and around the apartment till we’re dizzy and in the throes of deep lower back pain. This winter has been brutal in New York, and we’ve had snow days, with ice that lingers in playgrounds for weeks. Toddlers don’t seem to feel the cold, so off we went every day to play at the park, slipping and sliding over ice, getting numb fingers, toes, legs and noses. Ok, so I made this one up. But what else do you call it when you’re foolishly at a trendy restaurant with your squirmy toddler, passing her from parent to parent like a hot potato and simultaneously stuffing food down your throats until you’re both done – and so is the tablecloth, the floor and the restaurant staff, who are not-so-secretly glad to see the backs of all three of you as you slink out the exit after apologising for the mess (and tipping big, of course). I know this phase is fleeting. Every day she says new words, gets more agile, sprouts more hair on her fuzzy little head. So we chase. We run and catch. We watch and laugh, and store up these insane days in our memories for the day when we are having civilised high tea at The Plaza, and discussing the importance of Impressionism at the Met. Or perhaps we’ll just be buying her every type of protective gear we can get our hands as she takes up sports like kite surfing or motocross, and we’ll wish we were back in the toddler days when we could still catch her with our own two hands. People ask me all the time when we’re planning on having a second child. When I answer that we’re not, I always get a barrel of questions. I feel like everyone’s choice to have any number of children, from zero to 10, is a very personal decision, yet people seem to feel free to ask about our (and everyone else’s, it seems!) child-choices, frequently in front of other people. For the record, Alec and I are pretty sure we only want one child. Maybe in a few years we’ll change our minds, but I think it’s unlikely. Here are the reasons that we’re pretty sure Eloise is going to be an only child. 1. I had a horrible childbirth experience. 2. The first six months of Eloise’s life were miserable for all of us. A sad reflux baby and no sleep for anyone. We’re still traumatised by it. 3. I didn’t get a full night’s sleep for the first 10 months of Eloise’s life. She’s still a bad sleeper, and wakes up a few nights a week on average. I am so. tired. 4. Alec and I feel like we are just holding everything together, with having one child. We have no idea how people manage lives with multiple children. Our respect to all parents with lots of kids! We know that we just couldn’t handle it. 5. 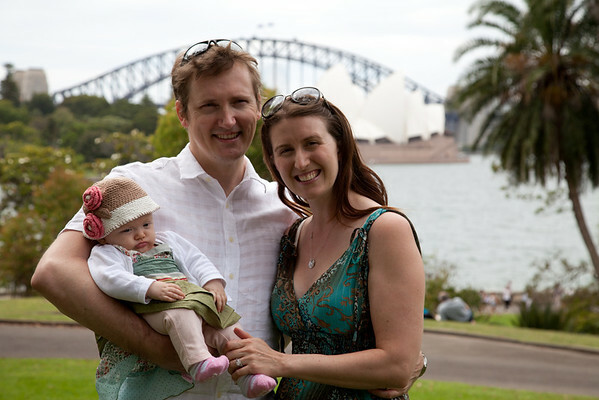 We want to spend a lot of our lives travelling, and want to take Eloise with us. The more kids you add to that, not only the more expensive it gets, but the more years you spend not being able to travel. 6. We want to give all of our attention and resources to Eloise to help her achieve her dreams. We don’t feel that with multiple kids we’d be as able to do this. 8. We both love Eloise so much it’s just insane. We feel so complete as a family of three that we just have no desire to add anyone else to it. I probably should have put this as number one, as it’s the absolute main reason. The other points are factors that reassure me that this is the right choice for us, but, at the end of the day, it just keeps coming back to our family feeling complete. Me, Alec and Eloise. I constantly think about how this choice of ours will effect Eloise. I don’t worry about her being bored or lonely – especially since we are living in Brooklyn, where she has friends all within walking distance. I expect it will be hardest on her being an only child when she is an adult. A lot of my friends get a great deal of support from their siblings who live nearby, helping with their kids. A lot also don’t get any help from siblings living nearby, so just having a sibling doesn’t necessarily mean you’re going to have more help with your family later on. The other thing is ageing parents. My number one biggest concern about having only one child is that Eloise will have to deal with Alec and I ageing and dying on her own, with no siblings to share this huge burden with. Life is so uncertain though, and you never know how things will go. While I’m a massive planner of everything possible, I don’t feel like this worry of mine is worth having another child, just for this specific concern. I hope with all my heart that Eloise will find an amazing partner like I did, who will happily share her life – and all the baggage it brings – with the grace and unselfishness that Alec has brought to my life. We picked up this mouse on a trip to IKEA. It was in a 99 cent bin, and we gave it to Eloise to kept her quiet while we shopped. At the checkout, we thought, “It’s only 99 cents, why not let her keep the mouse!”. Fast forward six months and this mouse is now one of two toys that Eloise simply can’t live without. The mouse is called “Mimi”, and Eloise calls for her before going to bed every night and every nap. Once we realised Eloise was getting so attached to this mouse, we went back to IKEA to get a back up mouse. Totally out of luck. It was only two weeks later, and all the ballerina mice were gone. Sadly, the worst thing possible happened – Mimi fell out of the stroller and was lost somewhere in DUMBO while Eloise was on a playdate with her babysitter. I didn’t realise Mimi was missing until it was bedtime, and Eloise was calling for Mimi when I put her in the crib. I looked around for Mimi, thinking she’d be under the crib or in the living room. No. No Mimi. 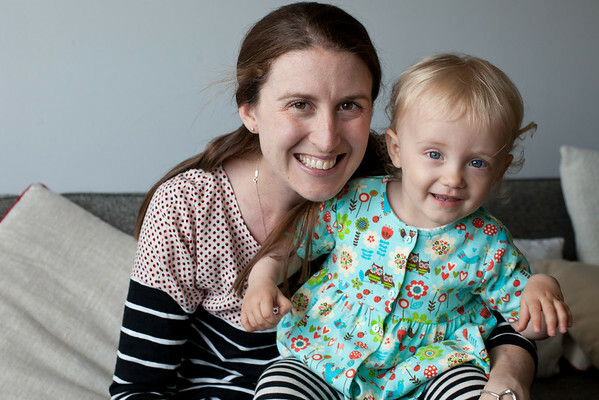 I felt panic rising as I searched the entire apartment – the recycling bins, our bedroom, the shoe cupboard, and the stroller. No Mimi. A flurry of texts ensued, to our sitter and my husband, who’d been watching Eloise in shifts that day. No one knew where the mouse was. I digress. Back to bedtime, with no mouse. With a sick feeling and a huge knot in my stomach, I told Eloise that “Mimi’s on holiday! you’ll see her soon!”, and put her in the crib. I hoped I would be wrong, and that she’d just roll over and go to sleep. Oh no. Of course not. Eloise cried for Mimi for over an hour before finally falling asleep. During the night, she woke up multiple times, asking for Mimi. It broke my heart every time that I couldn’t give her the little mouse that brought her so much comfort. In a desperate attempt to find the lost mouse, I emailed all of the Brooklyn parenting mailing lists, in hope that someone had found the mouse. “Help! Lost mouse!”, “Have you seen this mouse?”. The next step was eBay, where I found the mouse alright – now $13.95 instead of 99c. What a mark-up! Clearly I was missing out on a big business opportunity that other cunning entrepreneurs had stumbled upon – re-selling IKEA toys at a 130% mark-up. GENIUS for them, irritating for me. I ordered the mouse, and emailed the seller to request rush shipping. “Please!” I begged, “Can the mouse get here any faster?”. The seller helpfully offered to upgrade the shipping to get us the our new Mimi faster, but that still left me to get through the next several days with no mouse. 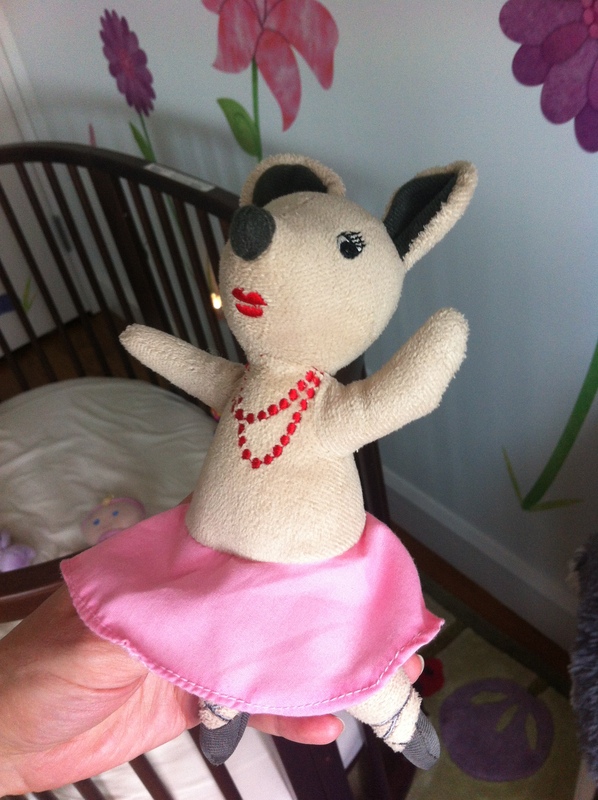 The next morning I considered calling IKEA and asking them if they could rip off the ballerina mouse I’d seen nailed to the wall in the kids section. The only thing that stopped me was the logistics of how I’d get to and from IKEA (it’s an hours walk) in between Eloise’s naps, playdates and class schedule. Four days later, thankfully the new mouse arrived. Every day in between, Eloise asked for Mimi before bed, after waking up, and every time she walked through the door, like Mimi had magically come home after her trip away. I’ve never felt so relieved as I felt when I saw that four-inch mouse in our mailbox. Lesson learned – I ordered yet another mouse from IKEA, just in case. We have new rules in place – the mouse doesn’t leave the house, and no more toys that aren’t easily replaced! Why not just not replace the toy, and let her get over it, you might ask. Am I enabling her dependance on toys? Quite frankly, I don’t care. I love seeing Eloise’s joy in her toys. She talks to them like friends, and feeds them pretend tea and Vegemite toast. I don’t want her to learn to “get over it” right now – there will be plenty of that in her life as get gets older, and I don’t want her to have to learn that lesson just yet. I don’t feel like I’m honest enough about how hard being a parent to a toddler is on a day-to-day basis. I post pretty pictures on Facebook and Instagram, and tweet cute or funny things that Eloise says or does. The reality is I love my baby girl with every ounce of my being – but some days are just. so. incredibly. hard. Physically exhausting. Mentally draining. Emotionally destroying. The good days and bad days mix with no rhyme or reason, and just when you think you’ve got everything under control and you’re in the clear, whammo, another bad day floors you to your knees. I’m prefacing my post with this because Mother’s Day was one of those days. Alec went above and beyond to organise the perfect weekend for me. A cupcake from my favourite bakery. A surprise massage. Home-cooked lunch, and a surprise dinner at a vegan restaurant I’ve been dying to try. And then Eloise’s two-year molars started to come in – at least, that’s what we’re guessing is going on. Now we’re back to a whingy, not-sleeping, screaming bundle of toddler. 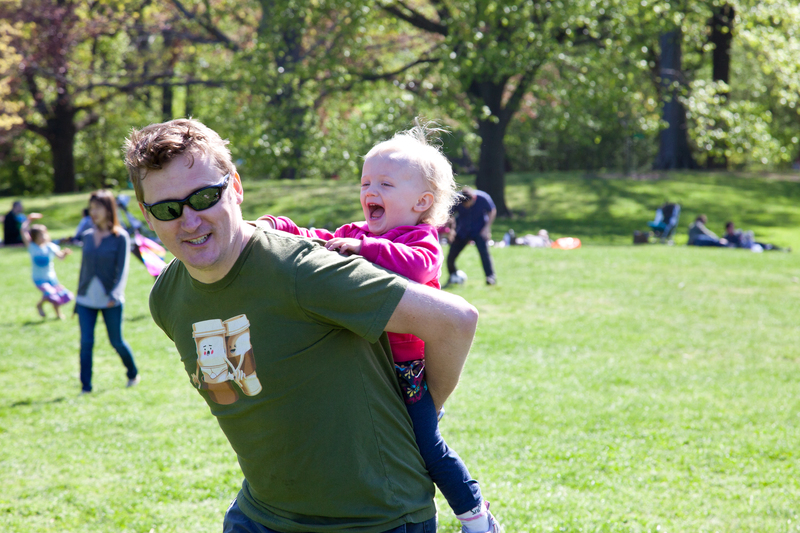 My Mother’s Day was filled with the humbling reminder that my enjoyment of life is – for the moment at least – highly dependant on the happiness of my child. Sad baby = no-one enjoys the day. We still tried to make the most out of it. Got out in the sun, went to a few parks, had a wonderful dinner together after Eloise went to bed. It was not the Mother’s Day I would have wanted, but, then again, that’s not the toddler I was given. So here are my carefully edited photos that tell a different story about my Mother’s Day. 20 takes later, this was the best shot. Notice she’s trying to escape? The other way to get an angry toddler to smile – let them do what they want. “Walk, walk walk!” You got it, baby! I like to joke about wanting Eloise to be a dancer, or a software engineer, but the truth is I don’t care what career path my little girl takes. What’s most important to me is the type of person she grows up to be. I have a lot of dreams for her – and I hope that I will be a good enough mother to help her become the kind of person who people will love and admire. So here’s my advice to my baby girl, on what I’ve learned so far is the path to happiness, peace of heart, and love. Be kind. To everyone, even people you don’t like. Be kind to animals, be kind to your elders, be kind to people you see being picked on. Be patient. You already show signs of my impatience, so this will be hard for you. Slow down, take deep breathes, control your irritability. I promise you if you can master this, it will serve you well throughout your whole life, and you will regret your behaviour far less than I do. Good luck with this though, as you’re already a little spit-fire. Know the consequences of your actions. You’re only one person, but everything you will do through your life will have reaching consequences, even if you can’t see them. A flippant comment to someone you don’t know might ruin their entire day. Be empathetic towards strangers and people who do you wrong. This is something that I’ve also struggled with a lot – not empathy towards friends and family, which is easy, but trying to keep my temper in check with people who aren’t in my immediate circle is really hard for me – and for you too, if you inherit this trait from me. Someone who is unkind to you might be having the worst day of their lives, you just don’t know it. When someone is a complete A-hole and steals your seat from you on the subway when you’re pregnant, imagine their hardships before assuming the worst. Try your hardest, anyway, and then tell them to give you the goddam seat. Value all life. If you choose to eat meat, know that an animal gave its life for it and think about that before you dig in. Stand up for yourself and what you know to be right. Note: this will not make you popular. But it will make you someone who is true to themselves, and not a sheeple. Please don’t be a sheeple, both your dad and I can’t stand them. Learning to act for yourself, especially when it’s against what everyone else is doing, is so hard when you’re a teenager, and even in your early 20s. People like people who are like them, and find comfort in it. If you’re different, it will start out hard, but will be ultimately rewarding as you find your true path in life. Standing out as a true individual will help you in ways you won’t be able to imagine when at the time all you can see is your friends at a party pressuring you to smoke something nasty. When you want to succeed in life, being an individual will help you step above the general masses to land jobs, be offered opportunities, and also help you to be truly happy with the person who you are. Go with love. Love as hard as you can – your friends, your family, your animals, your hobbies, and, hopefully, a life partner and then children, if you decide to have them. Love every day you wake up to, love the details, just love, love, love. It’s the most fulfilling pleasure you will have in life. Peace as I know it comes from acting kindly, patiently, empathetically and with love. When I do something like snap at friends, or take out my frustration on people who don’t deserve it, a few hours later I always feel bad. If it’s a particularly bad things I’ve said or done, I’ve felt bad for YEARS – in some instances I still feel bad whenever I think about it. Please learn from me. Make your own mistakes, don’t repeat my thoughtless ones. Little girl, I love watching you grow, learn and attack the world with joy. I hope I can guide your footsteps while you’re learning to run, skip and hop, and watch with pride in your shadow as you take flight into your own, beautiful life. Something I think about frequently is identity, specifically through nationality. The full identity issue is a much larger discussion and blog post than I’m tackling here. My national identity is pretty simple – I’m a Australian – at least fourth generation if not further. No matter how long we live abroad, I will always think of myself as an Australian. My parents are 100% Australian, as was my childhood home and education. So where does that leave Eloise? Is she American or Australian? Will she feel American because she lives here? If we move back to Australian in a few years, then what will that make her? Technically she’s an Australian born in the US, with dual citizenship. I often wonder what she will feel like as she grows up. 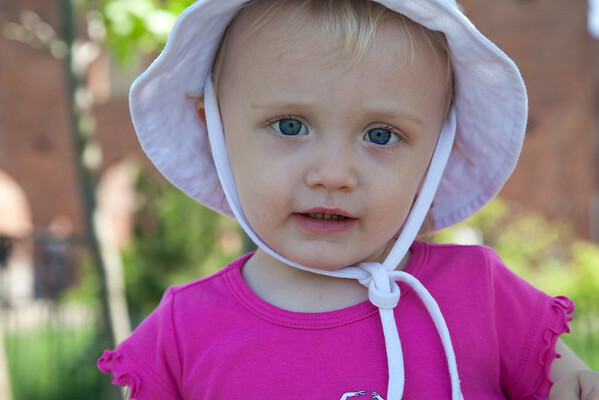 As she starts school she will pick up an American accent (nooooo!!!) and identify with her friends more than with us. Whereas Alec and I yearn for things like Cadbury chocolate and Gippsland yoghurt, will she prefer (god forbid) Hersheys and Chobani?. How do we help Eloise embrace her Australian heritage and nationality so it forms part of her identity? Read her Playing Beatie Bow, serve her Vegemite, make her watch The Man From Snowy River? Will she even care? The point is we do care, even if she won’t for what will probably be a long time. I hope that by constantly going back home to visit and by surrounding her with global experiences that she will embrace an identity of being more than just an American.